We're on the home stretch back to Picton now, driving the 800km or so from Queenstown to Picton in 2 days. The next plan is to take the ferry back to Wellington on Thursday, then the train back to Auckland on Friday, and back to Rob's place. 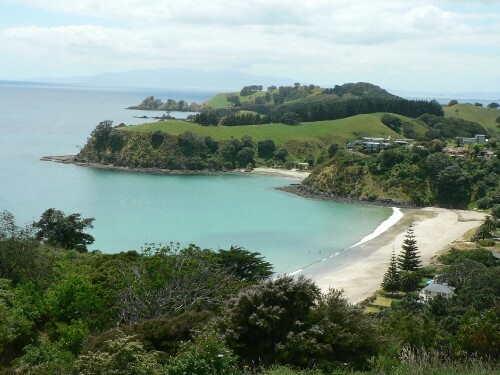 Then it's another road trip up to the top of the North Island. The east side of the South Island is totally different from the west - none of the lush rainforest vegetation, more pine trees and rolling fields of sheep, interspersed with swathes of vineyards. And more towns! We've stopped at Kaikoura, which is a lovely little seaside town by a rocky peninsula - the big thing here is whale watching trips out into the ocean, which I swear I will do one day, but not today...Last night we stopped at a motel in a town called Amberley near Christchurch, and I had a nasty fall on the slippery bathroom floor and hurt my bad knee, so today I've hardly been able to walk at all - fortunately driving is fine though. The people at the motel talked to us about their experiences of the earthquake on 22nd Feb this year, and the second one in June. The guy said 'we will never get over it' and that 27.000 people have left Christchurch since then. For a while they had aftershocks every hour, but now it's more like every week. We saw photos of the ruined city centre but were advised not to go in there. The ride from Queenstown to Christchurch was amazing - we went way above the tree line, through mountain passes lined with snow, along valleys where the bare, tawny mountains on either side looked like sleeping lions, with white peaks. We got an amazing view of Mount Cook (which we had seen from Fox Glacier, but from the other side this time ) across Lake Tekapo, which is a shimmering kingfisher blue due to the glacial sediment in it. The mountains surrounding it looked like they were made of Christmas cake icing sparkling in the sunshine. We've been so lucky - we've had bright sunshine and blazing blue skies for every one of the 10 days we've spent on the South Island, apart from a brief cloudy afternoon by Franz Josef glacier. I forgot to write about the ride from Franz Josef to Wanaka in a previous blog entry. We picked up a pair of Chilean hitch hikers called Jorge and Gerardo (they are cousins) at Franz Josef and they stayed with us all day, and did a hike with us at Fox Clacier, where we saw Mount Cook and Mount Tasman reflected in the waters of Lake Matheson - an iconic NZ scene! The journey to Wanaka was great fun, with Owen chatting to them about football all the way! They were really sweet and it was sad to say goodbye to them at Wanaka. We stayed the night at Wanaka (which is on a pretty mountain lake) before driving to Queenstown stopping to look at the old restored wooden buildings of the mining town Arrowtown on the way. It's funny, placeas like that are called 'historic' in NZ, but it's only about 120 years old!